When you attend a Bruce Springsteen concert, you’re guaranteed to get an electrifying assortment of hits and deep cuts from one of the greatest songwriters of our time, but the real surprises often come in the form of cover songs spanning the entire history of rock an pop music. Springsteen and the E Street Band have made a rousing rendition of the classic “Twist and Shout” a staple of their set, and the Boss even covered Lorde’s megahit, “Royals,” at a recent gig in New Zealand. During last night’s headlining set at the NCAA March Madness Music Festival in Dallas, Texas, Springsteen added Van Halen’s “Jump” to the setlist. Check out a clip of the performance, complete with a tipoff between Springsteen and guitarist Nils Lofgren, after the break. Last night’s performance marked the beginning of a spring tour that will take the E Street Band around the eastern half of the US. This week also includes another very important event for the group: On Thursday, they will finally be inducted into the Rock and Roll Hall of Fame. Springsteen was inducted in 1999, but his backing band is more than deserving of their own spot. 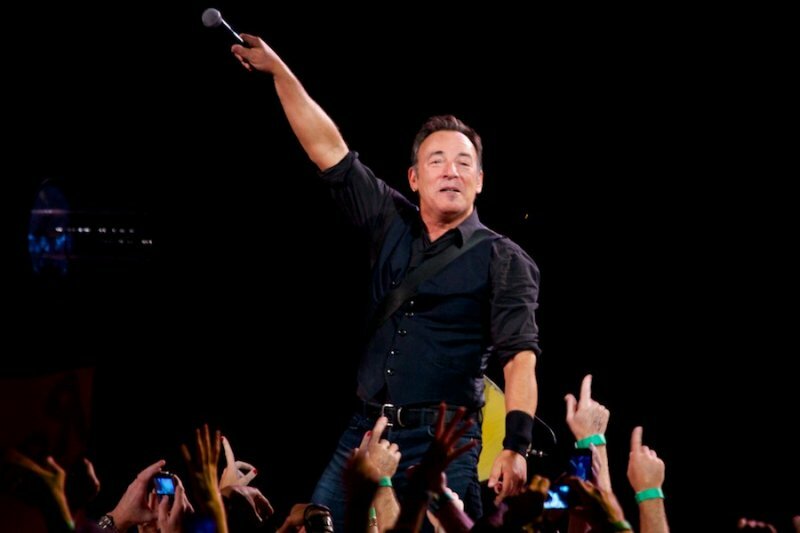 Pick up a copy of Springsteen’s latest album, High Hopes, right here.